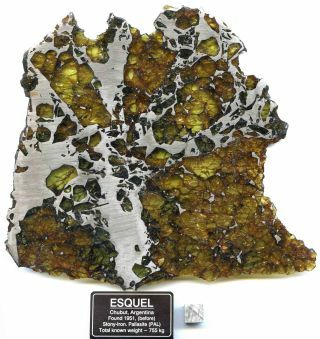 The Esquel meteorite, consisting of iron-nickel and olivine, was discovered in central Argentina. It is an example of a rare meteorite that may have been born from the collisions of magnetic asteroids in the early solar system, scientists say. Image released Nov. 15, 2012. Rare, gem-studded meteorites that resemble stained-glass windows when backlit may have come from magnetic asteroids that splintered apart in ancient collisions, scientists say. The solar system once may have been full of swarms of these tiny magnetic asteroids, investigators add. The space rocks known as pallasites, first discovered in 1794, are very rare, with only about 50 known. These meteorites are mixtures of iron-nickel metal and translucent, gem-quality crystals of the green mineral olivine. Chemical analyses have suggested the pallasites came from at least three different asteroids. The researchers speculated that any magnetized material within these meteorites might shed light on their formation, since asteroids would possess magnetic fields only under certain special circumstances. The researchers looked at metal specks encapsulated within olivine crystals in two pallasites. These crystals are far better at recording past magnetic conditions than the surrounding metal is. The investigators used a laser to heat the metal grains past their individual Curie temperatures — the point at which a metal loses its magnetization. The grains were then cooled in the presence of a magnetic field in order to become re-magnetized. By monitoring the grains using a highly sensitive measuring instrument called a SQUID ("superconducting quantum interference device"), the research team was able to calculate the strength of the magnetic field that these metal particles once possessed. The scientists found these metal specks were once strongly magnetized. This suggests the meteorites came from asteroids that were themselves once strongly magnetic, perhaps 4.2 billion to 4.4 billion years ago. Earth's magnetic field is created by its dynamo, the churning in its molten metal core. Since asteroids are relatively small, they would have cooled quickly and no longer possess molten cores or magnetic dynamos. However, recent analyses suggest that Vesta, the second-largest asteroid in the solar system, once possessed a magnetic dynamo. Past research had suggested that pallasites originate in the boundary layer between an asteroid's metallic core and rocky mantle, arising from the mixing of material one might find there. However, this would not explain the magnetization — if the pallasites formed this way, they would not have cooled sufficiently to become permanently magnetized before any dynamo in the asteroid decayed. Instead, the research team's computer models suggested these magnetic pallasites formed when asteroids collided with much larger asteroids, protoplanet-sized bodies about 250 miles (400 kilometers) wide. The impact would have injected a liquid mix of iron and nickel from the cores of the smaller asteroids into the larger ones, explaining the jumble of materials seen within the meteorites. The pallasites would have formed while the dynamos of these protoplanets was still active. "If pallasites really are made of metal from one object and minerals from another, then there might be chemical 'fingerprints' we can look for to prove this hypothesis," study author Francis Nimmo, a planetary scientist at the University of California, Santa Cruz, told SPACE.com. "Another critical measurement to make is to get the ages of the minerals. Our models predict particular age ranges for these minerals, which can be tested against age measurements." Tarduno noted the meteorites they analyzed represent only one of the parent asteroids of pallasites. "We'd like to sample some of the others," he said. "The techniques we've used here can be applied to meteorites of other small bodies as well." Past research suggests thousands of protoplanets at least 60 miles (100 km) wide once dwelt within the solar system. The new findings suggest many of these might have been magnetic. "The more small bodies we study, the more dynamos we find," Nimmo said. "The problem is that we don't understand what is driving those dynamos. Did they operate like the Earth's dynamo, or are they driven another way — for example, by their iron cores sloshing around after a giant impact?" The scientists detail their findings in the Nov. 16 issue of the journal Science.